This species is accepted, and its native range is S. DR Congo to N. Free State. Type:Zimbabwe, Kwekwe (Que Que), Norlindh & Weimarck 5133 (LD, holotype; BM; BR; SRGH). 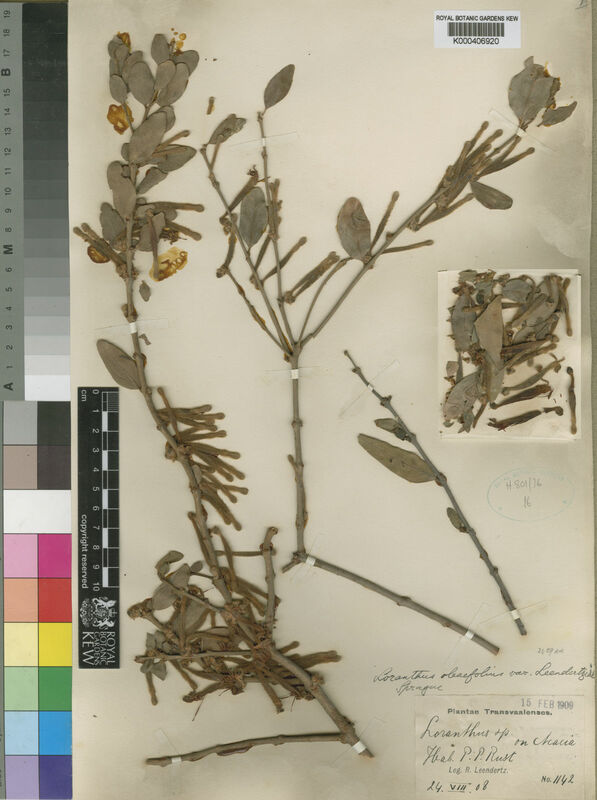 Mixed woodland and bushland or riverine, at higher altitudes than T. oleifolius; 900–1500 m; on a variety of hosts, but commonly Acacia, Dichrostachys and Combretum; flowering in most months. Differs from T. oleifolius by the longer hairs on the corolla, the tube of which is generally darker, but there is some variation in these characters. Plants from the middle part of the range, in Zimbabwe and particularly on the Zoutpansberg and Waterberg, have longer hairs, which extend from the tube on to the lobes (the white head in bud), but further north in Zambia, and southwards in the Middelberg and Magaliesberg, the hairs are shorter on the tube and notably shorter on the lobes. The southern plants, mainly from South Africa and adjacent Zimbabwe, have the darkest coloration of the corolla, reddish-purple, rather than dull red. In western Zambia the species intergrades with T. erianthus, see below. Stems spreading to 1 m or more; twigs puberulous, sometimes with longer hairs on youngest parts. Calyx 2–2.5 mm long, cupular, flared, slightly toothed, densely hairy. Style with neck 2–3 mm long; stigma 0.8 mm across, capitate. Berry red, 10 × 8 mm, obovoid-globose, glabrescent. Berry red, 10 × 8 mm, obovoid-globose, glabrescent. 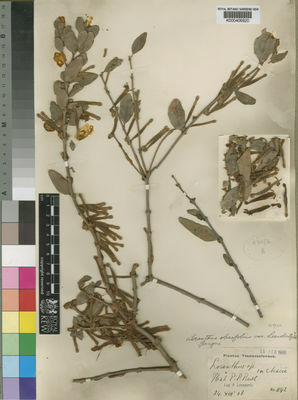 Mistletoes Afr. : 195, photo. 81, fig. 18D (1998).